The Natural Sleep Store works with likeminded and dedicated manufacturers who share our passion for the environment and offer only the highest quality organic products. At the top of our list is Sleep and Beyond. Sleep and Beyond creates beautifully made, healthy, organic bedding and does so in a manner that respects our earth, its natural beauty, and all of its inhabitants. Their integrity and passion for their work is evident in the products they offer and in their outstanding customer service. During an in-depth conversation with Sardor, a third generation member of Sleep and Beyond’s family owned business, I learned all about their family, their business, and their merino sheep in the Kyrgyz Republic. Throughout my conversation with Sardor it was very clear that he and his family love what they do. Sardor and his family feel very strongly about providing bedding that is high quality, durable and healthy to sleep on. Sleep and Beyond was incorporated in 1992, but the business was started in the 1970s by Sardor’s grandparents. Sardor’s grandfather would work on the farm and bring wool home for his grandmother to clean, card, and make into yarn. They were unable to incorporate their business because at the time what is now the Kyrgyz Republic was part of Russia. It was not until the Kyrgyz Republic gained their independence in 1991 that his grandparents were able to freely make their products and sell them to people in the United States. Sardor’s family’s perseverance in providing others with healthy, organic wool was strong and unwavering. During the 1970s the bedding industry started using more synthetic fibers and even though the fibers looked and felt like natural cotton or wool they were made from unnatural materials. This made it very difficult for Sardor’s family at Sleep and Beyond. Synthetics were so popular that Sleep and Beyond had to educate people about where wool comes from. Some customers even asked if wool comes from a tree. Through hard work, travel, and perseverance, Sleep and Beyond has a successful 3rd generation family run business, an industry leader for organic materials and products. 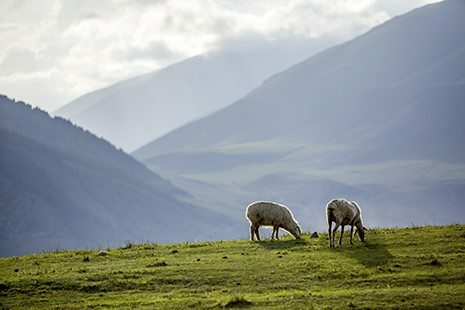 Each product from Sleep and Beyond starts as a happy healthy merino sheep roaming the mountainous hillsides of the Kyrgyz Republic. There are twice as many sheep in their country as there are people! Sleep and Beyond uses wool from 250 different farms throughout the Kyrgyz Republic. The sheep are kept in a natural environment where they are offered plenty of sunlight, clean grass to graze, and organic feed to eat. The sheep are even treated with medical care that is natural and holistic. The animal husbandry is of the best quality and the farmers take great pride in the care that they provide. The land of the Kyrgyz Republic is pristine and beautiful, home to one of the world’s largest glaciers, lakes and mountain ranges. Sleep and Beyond merino sheep have been grazing on chemical free, natural, and untouched land for over a quarter of a century. Thankfully, the Kyrgyz Republic government never wanted to spend money on chemical pesticides. After talking with Sardor and working with Sleep and Beyond I can easily sense that their family has a true respect for their country’s land and its sheep. Their respect does not stop there, because they also truly love offering quality and healthy products. Sleep and Beyond has used the earth’s offerings to create some of the nicest bedding items we can offer. 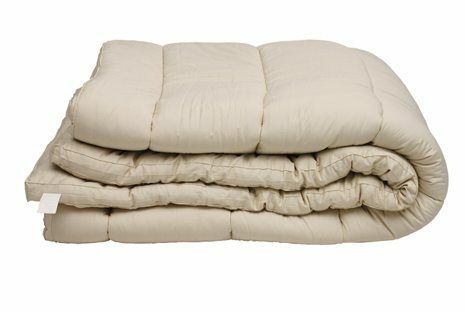 Wrapped around each organic wool comforter and organic mattress topper is a soft organic sateen cotton cover. The same quality sateen is also used to make Sleep and Beyond’s luxurious organic sheets. Sleep and Beyond may be known for quality merino wool but their organic cotton is durable yet unbelievably soft. The cotton used by Sleep and Beyond is GOTS certified (Global Organic Textile Standard) by Control Union and also has an Oeko-Tex 100 certification. Sleep and Beyond has not skimped on any other certifications to back up their organic quality and their fair treatment of animals and farmers. The wool used by Sleep and Beyond is USDA Certified Organic and has a Woolmark label, which requires stringent testing for quality, chemical and oil content, and product performance. The company has also received a fair trade certification and an ISO 9000 certification to ensure quality control, fair trade labor, and environmentally friendly practices. Quality and customer reassurance is a priority for Sleep and Beyond. To keep Sleep and Beyond’s organic certifications it is necessary for them to use only natural, unscented, vegetable based soaps when washing the wool. Since wool is a natural flame retardant there is no need to put any flame retardant chemicals on their organic toppers and organic comforters. Above anything else, I believe their mission statement says it all. Sleep and Beyond strives, “to be the industry leader by supplying [their] customers with the highest quality organic bedding at the most competitive prices with exceptional customer service and on time delivery.” Sleep and Beyond is not cutting a single corner to get their customers leading organic bedding. Their true passion helps them to create a fully transparent, quality product and company through and through.